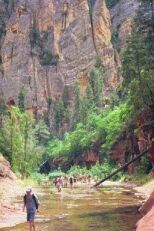 ArizonaHikers is a community driven site, dedicated to all those who love hiking & backpacking in Arizona, or anywhere. Surf over to our Community Discussion Board where you can register and join the discussion, ask questions or answer someone else's question. We hope to have more features in the future, so stay tuned. Announcement: Another new server again! So we moved the site to a new server today. If some posts got lost, sorry. Everything seems really fast, especially the Gallery. Let me know if you see any problems y'all!.